More than anything, a Martini must be served incredibly cold in a chilled glass and consumed relatively quickly. Gin is terrible when warm so do as Harry Craddock dictated and don’t dawdle. Also, though the Martini should be stirred, not shaken, I find a shaken Martini arrives colder and I don’t mind the tiny shards of ice that inevitably arrive floating in the shaken drink. If you don’t think the drink will be consumed quickly, consider keeping most of the gin in a very small carafe in a bowl of ice. The patron can then pour as they see fit. The original Martini was very wet, that is, it contained a very high ratio of gin to vermouth, some times as high as 2:1. There has been a reversion of late to the classic ratio in some bars but I was raised on a dry Martini and have a hard time going anything more than 5:1. There are obviously a million variations of this cocktail, including using vodka (or tequila, rum or whisky) as the base spirit, different proportions of different vermouths. adding other spirits or liqueurs or finishing with different garnishes. The true Martini, however is made with London dry gin and dry vermouth. Green olives on a skewer would then be considered the classic garnish but there are many variations, the Gibson with pickled onions being a favourite of mine. Use your best gin when mixing this drink as, obviously, it is the drink. I have a lot of gins but tend to stick to Nolet’s Silver, Monkey 47 or London No. 3. A Martini contains a lot of high proof alcohol. As a result, I only ever have one. Anyway, it was my first cocktail and is still that which I prefer and consume more than any other. 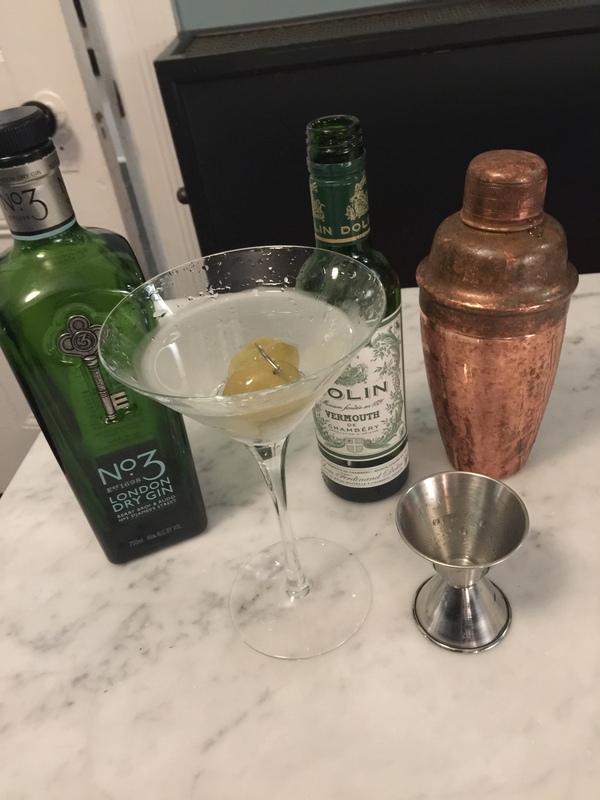 There is absolutely nothing that beats an ice cold gin Martini either at home on a Friday night while preparing a great dinner or at a restaurant’s bar with friends before an excellent meal. You will never, ever go wrong with this king of cocktails.